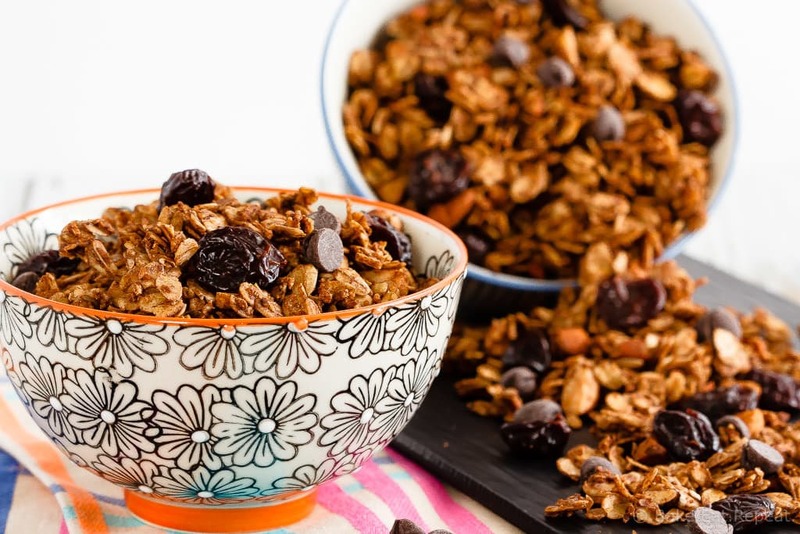 Quick and easy to make, this homemade chocolate cherry granola is a fantastic breakfast or snack, and it’s healthier then the store-bought kind! 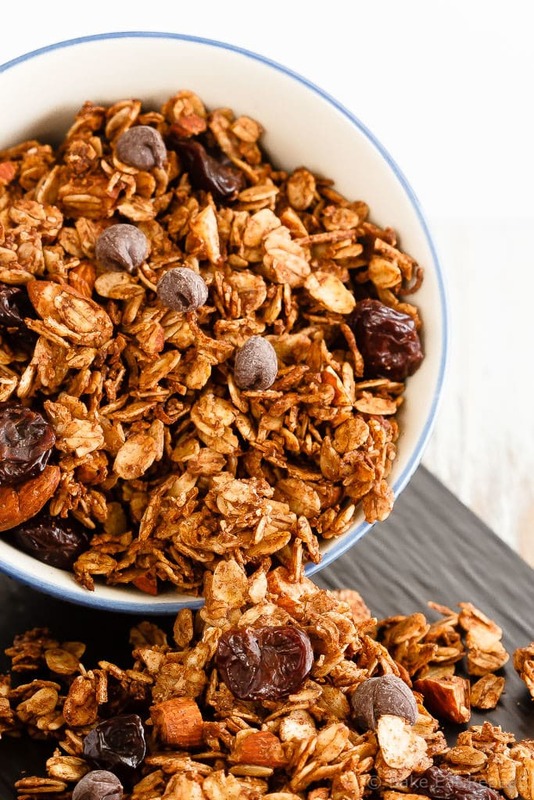 It’s been quite some time since I shared a granola recipe here. I’m a little bit sad about that. Mostly because the fact that one hasn’t shown up here is because I haven’t actually been making it lately. I don’t know why, but I seem to go in phases when it comes to food. I’ll make something incessantly for a while, eat nothing else for months, and then stop making it altogether. My kids have noticed this tendency of mine, and they’re not a fan. I get complaints. It’s an issue around here. They start asking when I’m going to be making something again. Why I haven’t made it. When they get to have it again. So annoying. Granola should be made. It’s amazing. Especially when it’s homemade – so much better then the stuff you get at the store. Plus you can put whatever you want in it then. Including chocolate. Because yes, chocolate does belong in your breakfast food. 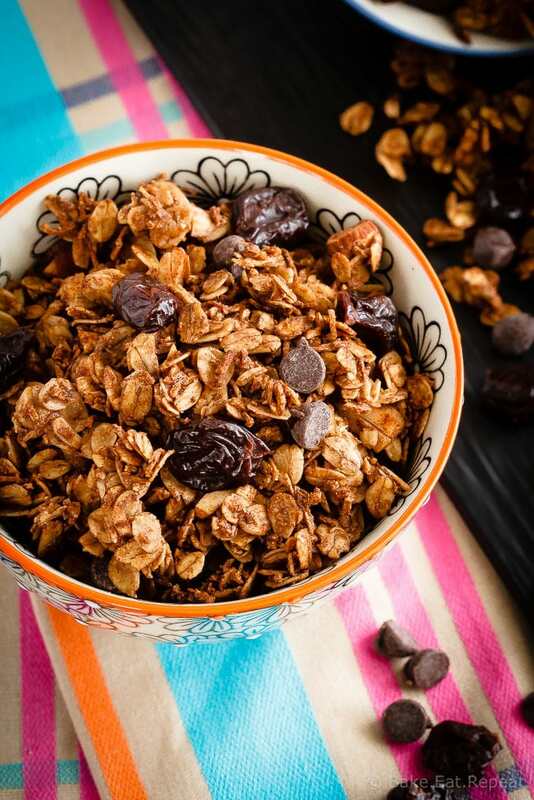 The day I made this chocolate cherry granola, my son walked in the house after school, spied it on the counter and said “yes, you finally made granola!”. Clearly it had been too long. Finally. He’s so deprived. I think I’m with him on this one though. Granola has been missing in our lives for far too long. It’s been my breakfast and snack of choice for the last couple of weeks again, and it’s probably going to stay that way for a while. I’m now planning to start working my way through all my archived granola recipes so we can have all of them again. Back to making granola incessantly for a while. My kids will be happy. Preheat the oven to 250 degrees F. Combine the oats, coconut, almonds, cocoa powder and brown sugar in a large bowl. In another bowl or measuring cup, combine the canola oil, maple syrup, and salt. Pour the liquid into the oat mixture while stirring to combine. Mix until the liquid is evenly distributed. Divide the mixture between two 11x17 inch baking sheets, spreading it out so that it's even. Bake for 1 hour and 15 minutes, until it starts to brown. I usually swap the baking sheets halfway through the baking time. Remove from the oven and allow to cool completely. Transfer to a large airtight container and stir in the chocolate chips and dried cherries. It will keep in an airtight container for at least 2-3 weeks. Source: Adapted from my favourite granola . I go in phases too where I don't make something, and then I always wonder why. And granola is definitely one of those foods. It's so easy to make and so delicious, so I need to start more, especially with this recipe. Love the chocolate cherry combo, Stacey! This looks like it would be a perfect breakfast or snack!